This tripod supports digital camera, card camera and smart phone. Whether you are a Novice or Professional photographer, you will need a steady and robust tripod for many of those wonderful photos. 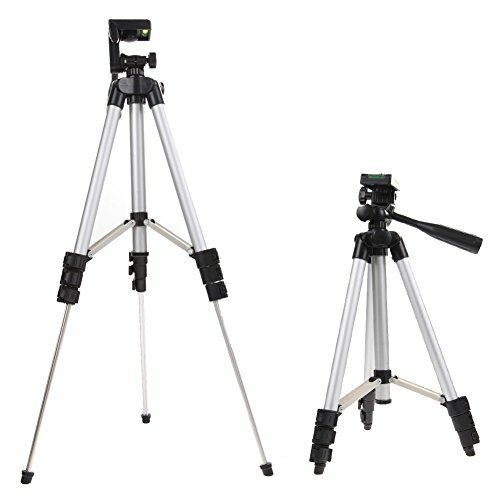 This Traveler Tripod with pan head design is the best choice for outdoor photograph activities. With built-in bubble level, making your tripod perfectly leveled. With non-slip rubber feet , it is ensuring single adjust of each leg, giving a more convenient leg handling. It is designed for part time photograph lovers. Help them take high quality scene or group photos without motion and long time human hand holding. 360° horizontal and 90° vertical swivel with 3-way head, With grip for adjusting head position, Solid Safety 4 Section Aluminum Legs with non-slip rubber feet. Compatible With:iPhone 6s, 6 6s /6plus ,5s, 5c, 5, 4s, 4,Samsung Galaxy S6,S6 edge,S5, S4, S3, Note5 Note4, Note 3, Note 2，HTC M9 ,M9+ ,M8, M7，LG G4 ,G3,G2，Nokia Lumia 1050,1020,920,830, 735, 635, 520.